The very best public art projects have a way of connecting us to the world around us. They make us look inward while opening ourselves to every other human on the planet. 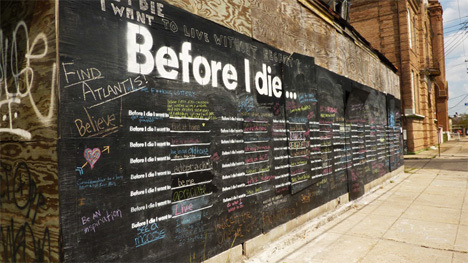 Few projects have had the kind of profound emotional impact that “Before I Die” by Candy Chang has had. 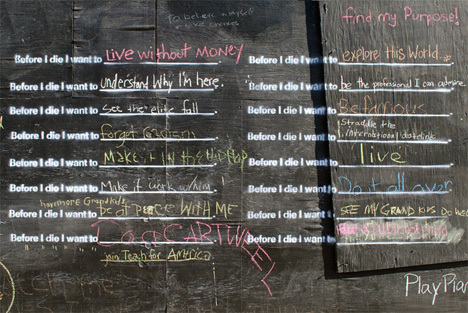 This incredible interactive installation in New Orleans helped passers-by both share their innermost desires and uncover the desires of those around them. 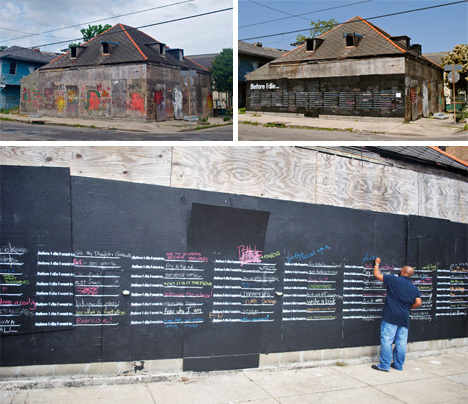 Before I Die was a large chalkboard installed on a long-abandoned house in New Orleans. 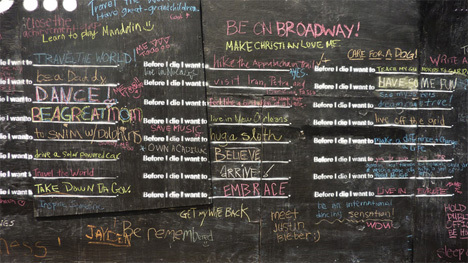 After receiving permission from the property owner, the neighborhood association, the neighborhood residents and plenty of other authorities, Chang installed the chalkboard and set to work stenciling “Before I die I want to __________” over and over on the surface. 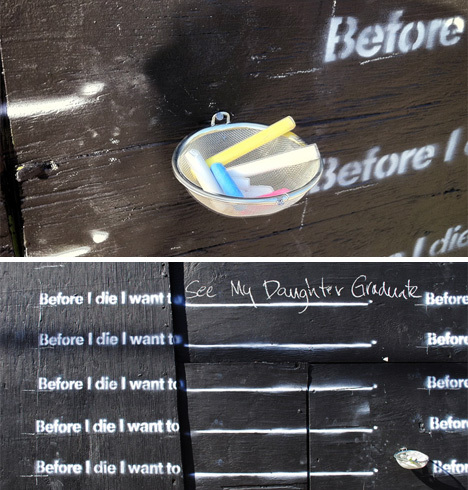 Small baskets of colored chalk were attached so that passers-by could scrawl their wishes, dreams and innermost desires. The initial setup was not even completed before people began stopping to share their stories with Chang. Once the crew was gone and the wall left to its own devices, people came in droves. 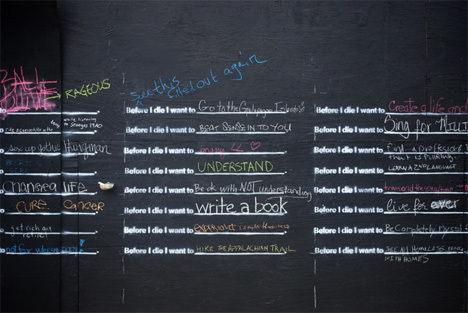 They scribbled their hopes, their wishes, their desires and their fears. They unabashedly shared their most closely-held wants with the world. They joked, they tugged at heartstrings, they acted too cool for public art. But most of all, they opened themselves up. The little revelations shared on the wall ranged from smarmy to sincere. They outlined desires to win back a lost wife, travel, see world peace, achieve inner peace, get rich, and make a difference, among hundreds of others. Once the spaces were all filled in, Chang erased the chalkboard and the neighborhood began again. A simple question – What do you want to do before you die? – inspired passers-by to reflect momentarily on their own mortality and what they hope to achieve in the short time they have on this planet. By asking residents to share a little piece of themselves, this project brought a neighborhood and an entire city closer together. Chang has plans to take the installation to other cities in a bid to return some usefulness to abandoned places and encourage people to get involved. The original installation has now been removed following the sale of the property. The new owners are fans of the project but in accordance with city regulations on blight had to commit to renovating the home as soon as possible. The building that went from a home to an urban abandonment to a beloved art project will now once again be a home. It seems a fitting fate for the structure on which so many people pinned their hopes and dreams.